On the MCX, crude oil fell over 10% to Rs 6,358 per barrel on September 30 as against Rs 7,366 on August 30. 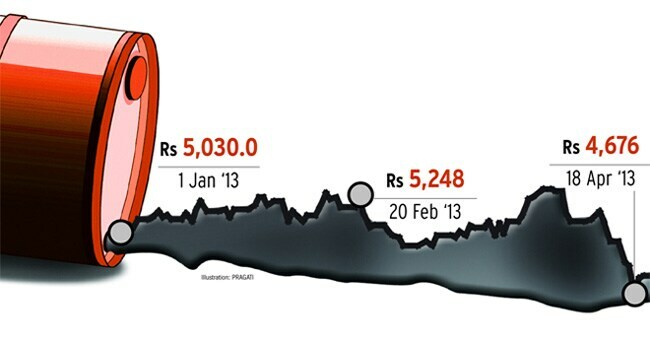 In dollar terms, the WTI crude fell 4.5%, while the rupee rose 5% against the dollar, impacting the price by 10%. A 60% return on investment within four months should be more than satisfying for any investor. That is exactly what an investment in crude oil in early April would have given you in the next four months. Renewed social unrest and political uncertainty in West Asia during the period sent crude oil prices soaring on the Multi-Commodity Exchange (MCX). They touched Rs 7,527 per barrel on August 29 as against Rs 4,676 per barrel on April 18. According to market experts, the main reason for the rise was surging geopolitical tensions, including talks of a US-led military strike against Syria. The improved global economic environment also boosted sentiment. Further, shutdown of Keystone pipeline, which is the biggest in US, for change in operations and flow system, and partial shutdown of OPEC refineries for maintenance purpose also supported prices. Sugandha Sachdeva, assistant vice president in charge of metals, energy and currency research, Religare Broking, says, "Investors were worried about violence in Egypt that could affect the Suez Canal through which a major part of the world's oil is shipped. There was also fear that it could spread across West Asia, where supplies were already facing disruptions. However, the improving macroeconomic sentiment supported prices as economies of Germany and France grew faster than expected, pulling the euro zone out of the 18-month recession." Reena Rohit, chief manager, non-agri commodities and currencies, Angel Commodities, seconds Sachdeva. "Crude oil prices jumped in the April-August period due to war-like situation in Syria leading to concerns that the same can spread over the Middle East. The US Federal Reserve's decision to continue its easy monetary policy and recovery in the euro zone also buoyed sentiment." Also, the rupee fell more than 24% against the dollar during the period, amplifying the price rise in the domestic market. In the international markets, crude oil jumped from $92.02 per barrel in April to $106.57 per barrel in August. After the four-month surge, there was a correction in September as geopolitical tensions eased. On the MCX, crude oil fell over 10% to Rs 6,358 per barrel on September 30 as against Rs 7,366 on August 30. In dollar terms, the WTI crude fell 4.5%, while the rupee rose 5% against the dollar, impacting the price by 10%. Market experts believe that the rise in crude oil production in Libya and Nigeria is also putting pressure on prices in global markets. Prathamesh Mallya, research analyst, energy, Anand Rathi Commodities, says, "More than onethird of Libya's oil production has come back on line in recent days. Oil production is back towards seven lakh barrels a day as on September 20 and full capacity of 1.6 million barrels a day will be achieved soon." On the domestic front, the dollar also had a softening impact on prices. Mallya of Anand Rathi Commodities is bearish on the commodity. "The decline is expected to continue in the medium term towards Rs 5,800 per barrel. However, if the rupee trades in the range of Rs 60 to Rs 64, we expect prices to top Rs 7,000-7,300 per barrel," he says. For fresh exposure in the commodity, CP Krishnan, whole time director, Geojit Comtrade says, "Dips to Rs 6,150 per barrel will be ideal for taking fresh long positions with a stop loss below Rs 6,000 per barrel. However, any unexpected drop below Rs 5,980 per barrel is likely to extend the selling pressure. By next year, crude oil prices will possibly correct and trade in the range of Rs 5,200-5,500 per barrel." >> Extreme events: Natural disasters can have a big impact on oil prices. US gasoline prices had risen 40% in the aftermath of Hurricane Katrina. >> Demand/Supply: Unexpectedly low supply or high demand pushes up prices. Demand from China, Japan and India is also a factor. >> US inventory levels: Low US inventory triggers uncertainty about the ability of the market to meet demand. >> OPEC spare capacity: Spare capacity in Organisation of Petroleum Exporting Countries, or OPEC, gives the market comfort that any extra demand can be met comfortably.